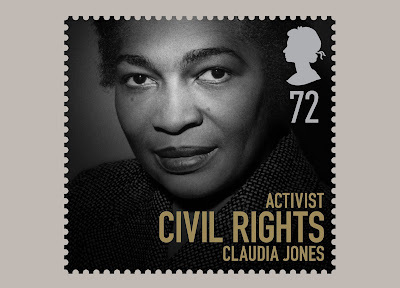 Civil Rights activist Claudia Jones is being honoured via a series of stamps produced by the Royal Mail. As part of the Women of Distinction series, Claudia along with five other women is being recognised for her lifetime achievements. Claudia is one of our pre-eminent black sheroes in this country. Born in Trinidad, she was raised in Harlem, NY before moving to the UK in 1955. From her base in Notting Hill she fought tirelessly for the rights of the black community and is also responsible for organising the first ever Notting Hill Carnival. In addition, the industrious activist also created the first-ever black newspaper in Britain, The West Indian Gazette. The stamps are on sale now. I just love, love, love your blog! Fashion Frenzy thank you so much, your comment has made my day. I've just discovered your blog and am loving that pic of the woman wearing the cornrows - must have that hairstyle. Look forward to reading more. Hmm, yeah about time they honoured her. She was a true heroine.